Like I said, my blog has been fairly quiet. What content I had been writing had been for my primary sponsor. That said, I need to give a shout out to one of my other sponsors who recently came on board, Chadderton Services in Easton, MD. In fact, he is so new to the sponsorship gig, he hasn't had a chance to get his logo printed out to put on the side of my car. Since I can't market for him on track yet, this is the best I can do right now. At New Jersey Motorsports Park, my clutch failed. At first we thought it was just a slave cylinder that failed, but that wasn't a job I had the time to tackle, so I had to take it to a mechanic I could trust. Fortunately, I had met a mechanic who used to race, and had gotten back into the HPDE scene! This meant I had a mechanic who understood the importance of things being done right and surviving the rigors of on-track abuse. 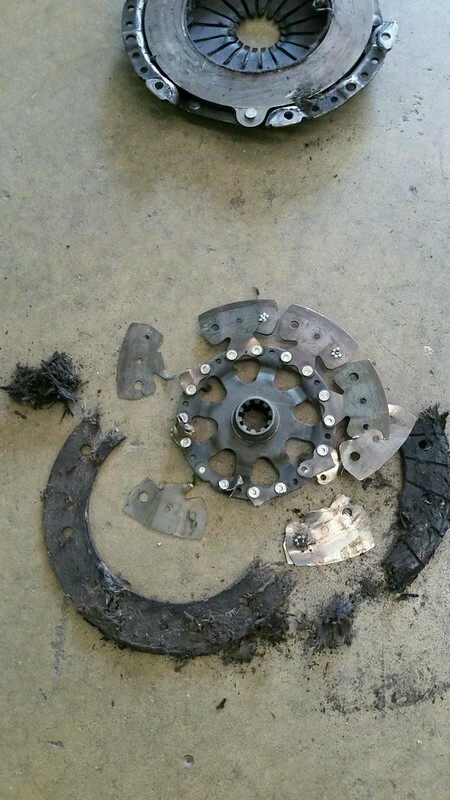 That clutch was less than a year old, but the flywheel had not been replaced at the same time. The wobble in the flywheel caused the clutch rivets to shear off and the clutch to...well...you can see. So I ordered up a single mass flywheel and clutch to replace that old dual-mass setup. Then came another surprise, the pivot pin, that I had ordered a replacement for LAST YEAR and gave to the shop installing that last clutch....was still the original plastic one. So, I ordered another one of those. All told, between my other two sponsors, eEuroparts.com and Rogue Engineering, I lost track of how many parts I had direct shipped to Kerry, and he had to order some on his own. Then Kerry and I agreed on a date that the car needed to be done (In time for this weekend's SCCA PDX/Club Trial event) and he was left to do his work. It is not often you find a mechanic you can trust, so when you do, you are willing to travel to have them do the work. In my case, it is about 1 hour from my house to Kerry's shop, but it is well worth the gas in piece of mind that the work will be done right. So if you are anywhere near Easton, MD and need a mechanic, give Chadderton Services a call!